Fjotra is a Nord child who is initially found in Broken Tower Redoubt. She has been kidnapped by a group of Forsworn and imprisoned in their redoubt. She is the daughter of Enmon and Mena from Karthwasten. She is the new sybil of Dibella, and you will be tasked with bringing her back to the Temple of Dibella in Markarth. Fjotra wears red colored child's clothes and a pair of shoes. 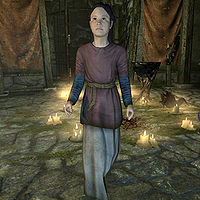 Although both her mother and father are Bretons, Fjotra is a Nord, suggesting that she was adopted. Fjotra is the only child follower in the game. As a child, she is invulnerable to attacks, making her useful as bait in a fight. This page was last modified on 22 December 2015, at 18:42.